Hob - From Ambient. The timings given below are a guide only, as variations between differing appliances can occur. Allow 20g of dry pasta per child. Place pasta into large pan of boiling water. Bring back to boil and simmer uncovered for 6 minutes or until tender, stirring occasionally. Drain and serve immediately with one of Annabel's sauces. 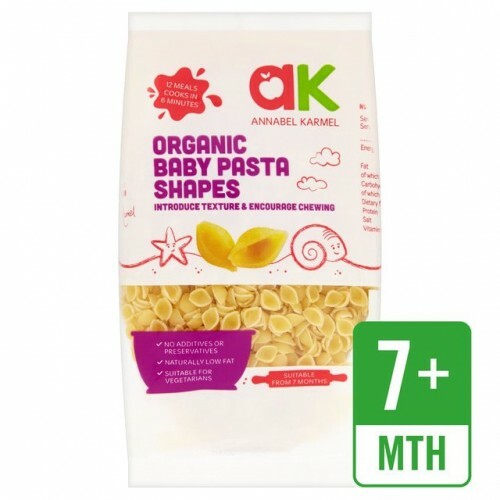 Adding my tiny pasta shapes to a tasty purée or sauce introduces texture and encourages babies to chew. It is also ideal for combining with meat, fish of vegetables. Try mixing a really delicious creamy cheese sauce with my pasta shapes and add some fresh salmon.